Cornish Pirates boss Ian Davies was impressed with his side after their 38-21 Championship win at Rotherham. The Pirates led 33-0 midway through the second half thanks to two tries from Marlen Walker and scores from Aaron Carpenter, Jack Arnott and Tom Channon. 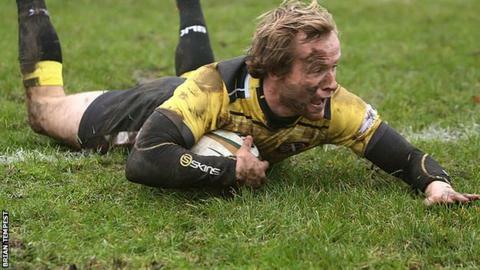 Rotherham touched down three times while the Pirates were down to 14 men, before Tom Duncan got a late sixth try. "Our kicking game was outstanding and certainly gave the platform for the forwards to perform," said Davies. "Last week was defence against an onslaught from Jersey with points on the board, this week was defence turning into attack and we certainly did that very well," he added to BBC Radio Cornwall. The victory sees the Pirates move up from ninth to seventh place in the Championship after what was their seventh win in eight matches in all competitions. "It's a tough old league - week in, week out you've got to perform and you've got to play," added Davies. "We had some poor results at the start of the season, a couple of decisions on the field and things like that probably cost us a few points and we knew that we weren't a million miles away from it. "We've just rolled our sleeves up and worked hard and got on with it."